The Federal Trade Commission today released a statistical survey of fraud in the United States during 2011, which showed that an estimated 25.6 million adults – 10.8 percent of the adult population – were fraud victims. “The FTC fights fraud every day by taking scammers to court and telling consumers how to avoid being scammed. Studies like this one help us fine-tune both our enforcement and education efforts,” said Charles Harwood, Acting Director of the FTC’s Bureau of Consumer Protection. While fast-growing online commerce has benefitted consumers with greater choice and convenience, the survey indicates that, as of 2011, the Internet was also the place where consumers most often learned about fraudulent offers. The Internet category, which included email, social media, auction sites and classified ads, was followed by print advertising, and TV and radio. 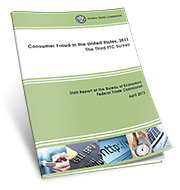 Most consumers bought fraudulent items via the Internet; telephone purchases ranked second. An estimated 17.3 percent of African Americans and 13.4 percent of Hispanics were victims; the rate for non- Hispanic whites was 9 percent. The survey found that high school graduates were the least likely to have been fraud victims; those who did not complete high school were the most likely to have been victims. Consumers who were more willing to take risks and those who had recently experienced a negative life event (such as a divorce, death of a family member or close friend, serious injury or illness in their family, or the loss of a job) were much more likely to have been victims. Consumers who indicated they had more debt than they could handle were significantly more likely to have been fraud victims than those who were more comfortable with the amount of debt they had. The FTC offers more information for consumers in 10 Ways to Avoid Fraud, Avoiding Online Scams and Common Online Scams. The Commission vote to release the survey was 4-0.